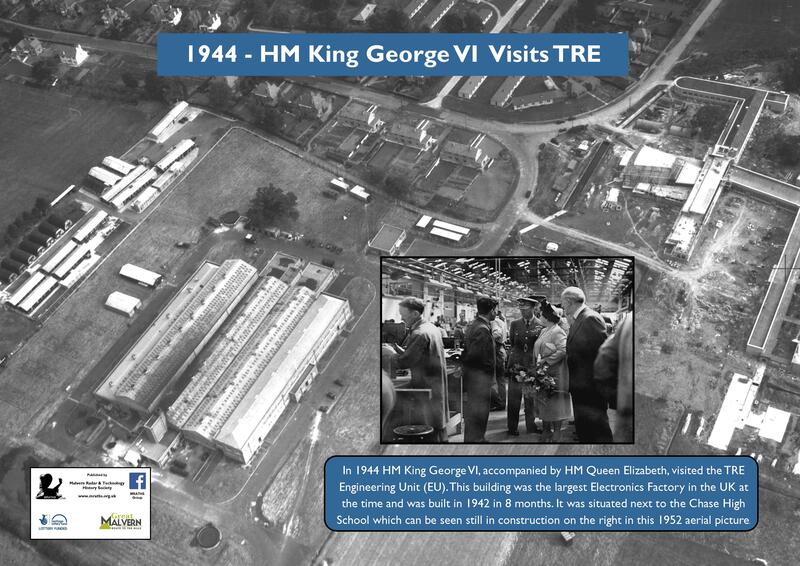 On 19th July 1944, King George VI and Queen Elizabeth visited TRE to see for themselves the important work in support of the war effort and also to encourage TRE staff. 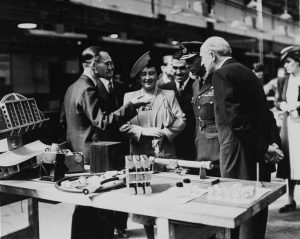 Their visit included sight and epxlanation of the “latest” 10cm airborne radar, seeing Preston Laboratory at the Malvern College site and meeting the Superintendent, AP Rowe, Bernard Lovell (later Sir Bernard, famous for his radar work) and F C Williams (famous for his storage tubes used in the MOSAIC computer). 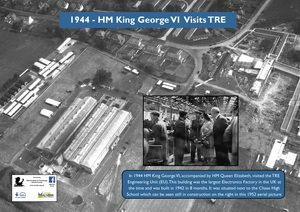 Their visit also included a short drive to the recently built Engineering Unit (EU), which was also known as “The Factory”, across the road from where the Chase school is now but was, at that time, part of the college playing fields. After visiting EU, the royal couple performed an investiture ceremony for Mr Charles Pankhurst, who had been with TRE since its predecessor was based at Bawdsey, and the ever resourceful, former Chief Petty officer, “Chiefy” Francis who both received the British Empire Medal for long and loyal service. On their return to the college, they visited the vision laboratories before, curiously, the Queen was driven to lunch whilst the King walked!